Product prices and availability are accurate as of 2019-04-23 19:03:41 UTC and are subject to change. Any price and availability information displayed on http://www.amazon.com/ at the time of purchase will apply to the purchase of this product. Welcome to Jiayiqi store. We sale many fashion jewelry, such as necklace, bracelet,earrings,rings and so on. Details please see our store. Hope you can find your favorite product. Thank you! If you are satisfied with our products, please recommend to your friends and family.Thank you very much! If there is any problems about our product, please write to me. We will help you! Kindly NOTE: Because it is use the pure natural plant, so every flower is a little different. 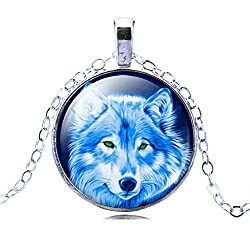 Cool wolf design, variety wolf life style let you close to animal and natural. Suit for women and girls. Suit for casual wear, festival gift or other any occations. Jiayiqi (Trademark Registration Number:86952724), we have not authorized any third parties to sell our products.